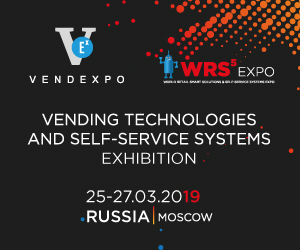 MOSCOW, Russia — The 13th International Exhibition of Vending Technologies Vendexpo and the 4th Exhibition of Self-Service Systems WRS5 will take part in Expocentre, Moscow, on March 25-27, 2019. In 2018 the Exhibition grew half as much compared to 2017. 150 brands took part in the Exhibition, among them 33 companies exhibiting for the first time. Apart of increase in size, the number of participants also increased by 30% compared to 2017. Among new concepts the following ones were showcased: Oranfresh, an Italian manufacturer of machines selling fresh juice; Giesecke+Devrient, German developers and suppliers of leading solutions in cash recirculation; Televend company from Croatia developing telemetry systems for vending; and many more. Rheavendors East participated again and presented a product range of floor standing and table-top coffee machines. Business program evoked great interest among the visitors, especially sessions devoted to Federal Law FZ-54 and new fiscal solutions. Besides, speakers were talking about equipment leasing, effective marketing instruments as well as vending business in regions, etc. In 2018, for the first time, the exhibition was held in line with International Franchises Exhibition BUYBRAND Franchise Market that created unique synergism. During 3 days there were registered over 9 000 visits at both exhibitions. Entrepreneurs came from 28 countries. In 2019 the exhibitions will be held in a single site again. In 2019 the range of the technologies showcased at the exhibition is expected to be wide. At present over 70 brands expressed their wish to take part in the exhibition, among them: Bianchi, EVOCA Group, Rheavendors East, Moscow sales auxiliary plant (MSAP), ICT and many others. Besides manufactures of vending machines, cutting-edge HoReCa solutions, water selling machines, innovative IT business solutions, cash register equipment, self-service systems, including self-service car washes, self-service laundries and many others will be showcased at the exhibition. Over 50 speakers will take part in the business program of exhibitions to share their unique practical experience and business cases. The Best Vending Beverage contest organized by EMTG company supported with “RosChaiCofe” association will be held as part of the exhibition. The exhibition is held under the patronage of the Chamber of Commerce and Industry of Russia, supported with RNVA, OPORA ROSSII.